On September 11th, 2001, nineteen Islamic extremists hijacked four commercial airliners from Boston, Newark and Washington DC. Two were flown into the World Trade Center, collapsing both Twin Towers and burying Lower Manhattan under dust. One slammed into the Pentagon, striking at the heart of America’s military machine. The other crashed into a field in rural Pennsylvania. The panic first descended upon America at 08:38 Eastern Daylight Time. The Federal Aviation Authority reported the hijacking of American Airlines Flight 11 to NORAD (North American Aerospace Defense Command). This was just the beginning. 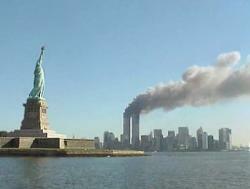 Less than ten minutes later, Flight 11 crashed into the World Trade Center’s north tower. Framed against a blue sky, the north tower was billowing smoke across the city when Flight 175 was flown into the neighbouring south tower. At this stage, there was a total lack of comprehension. At first, the impact of Flight 11 was thought to be an aviation accident. Minutes later it was becoming clear that America was under attack. News reports varied wildly. Some speculated that up to 50 airliners had been hijacked. President Bush was informed ten minutes after Flight 175 hit the south tower. He was addressing school children at the time. By 09:30 he was addressing the nation. A besieged America evacuated the White House. Capitol Hill was emptied. All flights were grounded after a third plane, American Airlines Flight 77 crashed into the Pentagon. While the emergency services rallied towards the towers, the FBI released a statement confirming that they were investigating the possibility that a number of civil airliners had been hijacked. Amid horrifying scenes, where people trapped in the burning towers were jumping from windows rather than perishing in the fire, the south tower collapsed. Minutes later, at 10:03, United Flight 93, bound for San Francisco from Newark, came down in Shanksville, Pittsburgh. Lower Manhattan was now buried under debris, shrouded in inches of grey dust. 10:28 and the north tower collapsed too. New York’s skyline had disappeared in the mushroom cloud. New York resembled a war zone as people fled from the advancing dust storm of debris. The attacks killed 2,999 people and irreversibly changed the world in the course of one morning. Type in 9/11 into Google and you’ll find 180 million entries relating to the most defining moment of the post-war era. It was an epochal moment that coined phrases like the ‘War On Terror’, and brought worldwide infamy to al Qaeda and its leader, Osama Bin Laden. Al Qaeda had been a relatively unknown entity. Some may have been aware that its loosely connected battery of Islamic extremists existed, the organisation coalesced during the fight to expel the Soviets from Afghanistan; now, the organisation had entered everyday parlance. Bin Laden was the world’s most wanted man. And amid a climate of fear, outrage and tragedy, the USA and its allies invaded Afghanistan , the country believed to be sheltering Bin Laden and training al Qaeda operatives. Seven years on – after wars in Afghanistan and Iraq, the bombings of the London Underground and the process of extraordinary rendition for suspected terrorists – the world has been changed as dramatically as the Manhattan skyline.